"Barroso is a deluded idiot. He is a communist." Jim Rickards, one of the greatest financial minds in the world today, spoke with Capital Account this week following the Fed's most recent policy announcement. He discusses what Operation Twist means for risk assets, Europe's next move, and how it will impact precious metals moving forward. The interview begins 3:00 minutes in. For more on the future direction of gold see Gold Market Review: Where Are We Today? Gold Market Review: Where Are We Today? Heading into tomorrow's Fed meeting, after reviewing Art Cashin's thoughts on possible announcements, I thought it would be a good idea to review where we are in the current bull market for gold. I have long believed that the final price of gold during the mania stage of this bull market will be tough to determine in terms of dollar price in advance of its final parabolic move up. 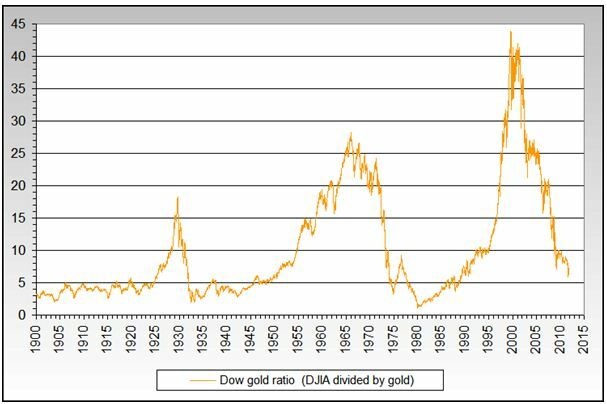 It is best to try and forecast this number by comparing gold against historical peaks in previous bull markets, specifically the early 1930's and the late 1970's. 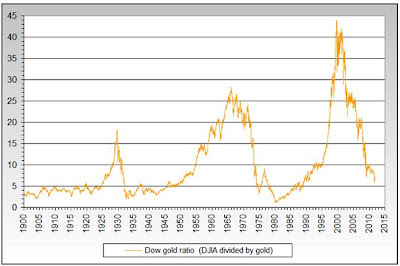 During both bull markets the DOW to Gold ratio reached close to 1 to 1. This means you could purchase the value of the DOW with one ounce of gold. In order for that to occur today, the DOW would need to fall to 1619 (gold's price as of this writing) or gold would need to move up to $12,837 (the DOW is currently at 12837 as of this writing). Most likely they will meet somewhere in the middle so you can see that we still have a long way to go in both the stock market's secular bear market and gold's secular bull market (which both began in the year 2000 and most likely have about 4 to 5 more years remaining). The following graph shows the DOW to Gold ratio moving toward its bull market bottom after falling from 44 in 2000 to only 8 today. It is following its normal cycle process as all secular markets do. A second measure of where we stand in the bull market is the price of gold related to the total amount of money (credit and currency) in the financial system. 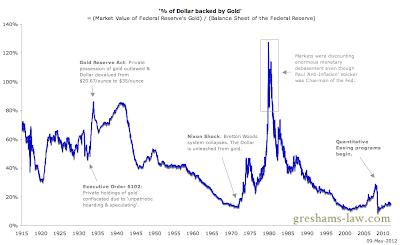 In the 1930's and for a brief period in 1980 gold moved high enough in price to "account" for all the new money and credit that had been created. The following chart goes back to 1915 showing gold's most recent "accounting" in 1980. 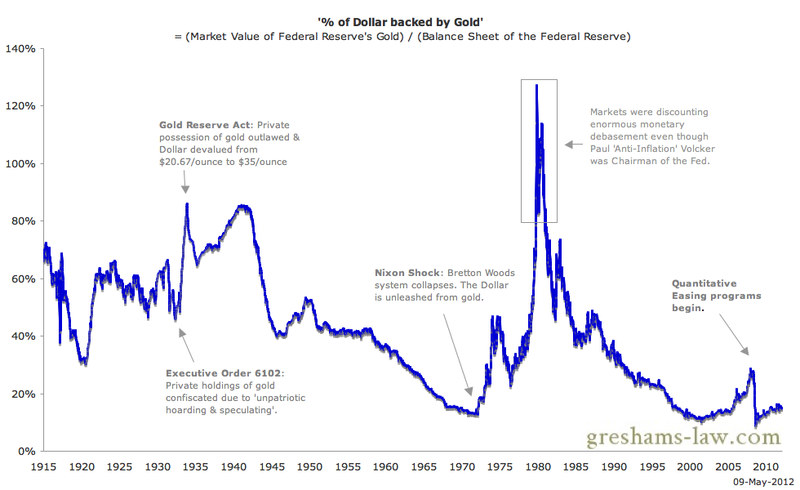 Based on the recent monetary expansion during the QE programs the price of gold is close to the historical lows of the past 100 years - accounting for less than 20% of the money in circulation. The following chart shows how far gold would have to rise to fully back the monetary base today - $8,500 an ounce. It divides the US monetary base by US official gold holdings. This was how the government determined the $35 gold price during the Bretton Woods agreement back in the 1930's to fix the dollar to the price of gold. This only includes how much money has been created thus far, it does not include any new announcements or additional printing Bernanke may announce tomorrow or in the future. Deflationists will argue that credit will contract significantly in the years ahead and that any central bank stimulus provided thus far is only a small hose being poured into an ocean when you look at the entire credit market (this is correct). They believe that the central banks will not have the political will to keep the mountain of credit growing in the years ahead (debt default will outpace new money creation). They may absolutely be correct on that point as well. When looking at the entire credit market ($54.58 trillion) + the base money supply (m1 which is just over $2 trillion) the price of gold today would need to be $53,000 today to 100% account for the total money supply as it did back in 1980. This is not some pie in the sky fantasy number. It is basic math that can be done with a pencil and calculator. If the worst case scenario that the deflationists foresee occurs and total credit contracts (due to debt defaults) by 50% to only $27 trillion, then gold would only need to rise to $26,000 an ounce to complete its basic accounting as it has throughout history. In any possible future scenario gold is undervalued today in terms of its price vs. the money supply. My guess is that the final chapter of this bull market will bring a move greater than any mania we have seen in history. Do not be discouraged if prices fall in the short term. Continue to accumulate. For more on precious metals and deflation see Why Precious Metals Could Surge During A Deflationary Bank Run. That headline and picture came from a recent article in the Atlantic discussing the market's last hope as the economic data continues to crumble around the world. While we wait with breathless anticipation to hear how much stimulus the Federal Reserve chairman will announce tomorrow at 2:15 PM, we get Art Cashin's thoughts today on what may be in store. 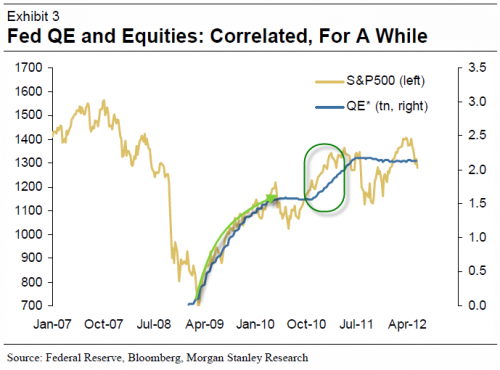 The following graph shows the Federal Reserve's correlation to stocks during their QE programs since the financial crisis began in 2008. 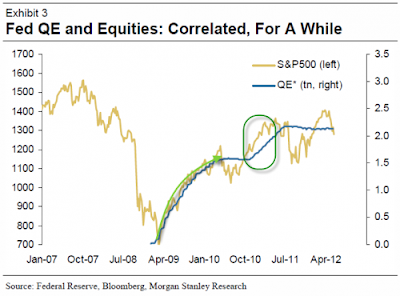 The blue line shows the QE programs (balance sheet growth through money printing) and the gold line shows the S&P 500 tracking higher with every money printing boost. They have once again intersected while the world waits on Bernanke's announcement. 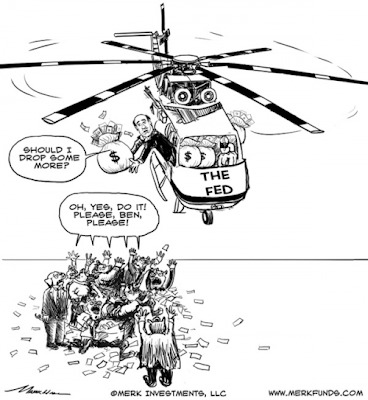 The biggest scare the markets could receive would be the Fed announcing the next round of QE with a reactionary sell off in stocks. Whether that will be during QE 3, 4, or 5 is unknown, but it is coming. Scott Patterson, author of "Dark Pools," discusses how artificial intelligence or high frequency trading machines are now dominating and threatening the stock market. High frequency trading now makes up 60 to 70% of the trading in a single day. These machines were the direct cause of the flash crash, and there is nothing to stop another flash crash from occurring at any moment. Peter Schiff spends some time with Fox Business News discussing the similarities of Greece and Spain with the United States. The US will have its reckoning day, but I believe it will come after Japan and the UK. Peter believes it will come sooner. In either case, Peter discusses the global investment that will perform well as we move through every currency crisis around the world: gold. Daniel Hannan provides a brief but well spoken argument against the current actions of European leaders.